We stopped by the library this week to freshen up our reading repertoire. After visiting the fish and playing with the new toys they have, Lily wanted to pick out an "Olivia" book, so we grabbed "Olivia and the Missing Toy" for the second time. Mom used to take us to our library all the time growing up. My sister Sarah and I would bring home gigantic (not to mention heavy) stacks of picture books -- often the same ones over and over again. I had visions of browsing for the books I remember reading as a child -- "Amelia Bedelia," "Miss Nelson," Stephen Kellogg books, and any story featuring horses. Alack, Jovie had visions of climbing through the shelves, picking up shrapnel off the carpet and putting it in her mouth and crawling away at high rates of speed to anyone who acknowledged her. Suffice to say, there was no browsing. 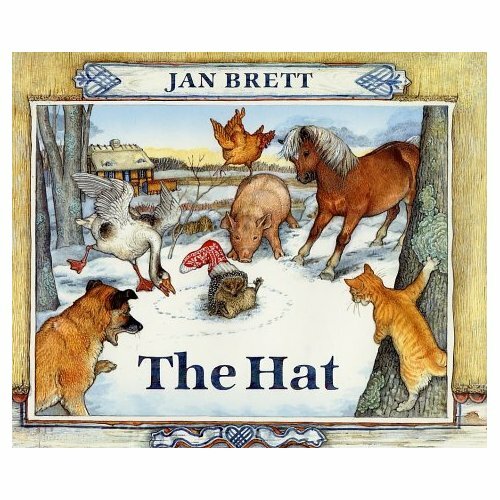 I grabbed "The Hat" by Jan Brett, "Maisy Goes on Vacation" by "Lucy Cousins" (we're big Maisy fans, too), and a couple of books from a section of princess books seemingly curated for Lily. I can always tell how good the haul is by how many times we go through all the books in the stack -- Lily has me read this round at least three times a day, so I'd say we made out pretty well. After finishing "The Hat" for third or fourth time, I was reading the back of the dust jacket and was excited to find that the author had included the anecdote that inspired the story about a hedgehog who wore a woolen sock as a hat. It turns out Jan Brett had a pet hedgehog who had wandered into a slipper sock and gotten stuck because of her prickles. The setting for the story was inspired by a visit to the home of Hans Christian Andersen in Denmark. I've always thought it was cool to get a peek behind the curtain when it comes to art. It's interesting to see how someone can take a simple image, event, moment, etc. and build a narrative around it. As a reader,I always wonder about the seed that planted the story. I wonder about how much of the author is in the story -- which people and places are real, which events actually happened -- and which were a figment of the writer's imagination. It's not that I still can't get lost in a story, but there are always characters you wish might have actually existed. And especially now that I'm taking a stab at fiction, I never know how much I'm allowed to borrow from reality. Maybe you can borrow as much as you want, you just don't tell the reader. I recently wrote a story about self-publishing for the Daily Record. Pam Bender, one of the writers I interviewed, told me that her novels were deeply personal, but that she categorized them as fiction because it's not as if she could remember every conversation and every event that occurred to the letter, and anyway, they were all told through her perception. "Never be afraid to tell your story and don’t be timid about what you’re saying because you wonder about how other people feel ... If you’re going to tell your story, you have to tell your story and be brave," she said. She learned early not to tell her readers what actually happened and what didn't; which characters were real and which weren't. "You never tell your readers what is fiction and what isn’t," Pam Bender said, adding that one of her readers was devastated to find out that a character she'd love wasn't based on a real person. I don't know that I'd ever be crushed to find out a beloved character wasn't an actual person. But sometimes it's nice to know they do exist. Take "Olivia," for instance. I enjoy reading "Olivia" books as much as Lily loves listening to them because Olivia herself has such a fantastic voice and presence. She is so life-like in her dreams and digressions that she has to be real (albeit not in pig form). "All of the characters are my sister's family: my niece Olivia's parents, her two little brothers, and their cat and dog. But they are all just peripheral. It's really all about Olivia -- at least in her mind!" Also, I believe Lily would embrace (if she hasn't already) the concept that everyone else in the household is peripheral to her. In fact, it's probably so evident in her mind that it never needs to be expressly stated. Oh to be 2. If anyone were to peek behind my curtain (I hope they don't) they'd find a 60,000-piece puzzle scattered about the floor with pieces of reality and pieces of imagination waiting to be fitted together in some sort of meaningful way. And me staring out the window. I would go a step further and say that (from my limited experience) revealing almost any of the truths or motivations or reasoning behind any story ultimately disappoints readers. Hemingway said that it is bad luck to talk about writing, because it takes off "whatever butterflies have on their wings and the arrangement of hawk's feathers if you show or talk about it." Writing a story is like a magic act. Readers know they are watching an act, and as much as they might say they want to know...they don't ever really want to know. What they want...is to believe. I like that analogy of storytelling as a magic act. I'm coming from a journalism background, so maybe I'm just too nosy sometimes about how things came to be. But then again, I also love getting lost in a book. And how obnoxious is it that Hemingway is even poetic when just talking about writing?